It is true that the people of Indore trip on food. I mean, I have read a lot about the food scene of Indore but they take things to another level. From originals like Bhutte ka kees and Garadu to their own take on several popular dishes like Shikanji and Jalebi, the city has many quirks up its sleeve. I hardly saw any restaurants serve full meals. 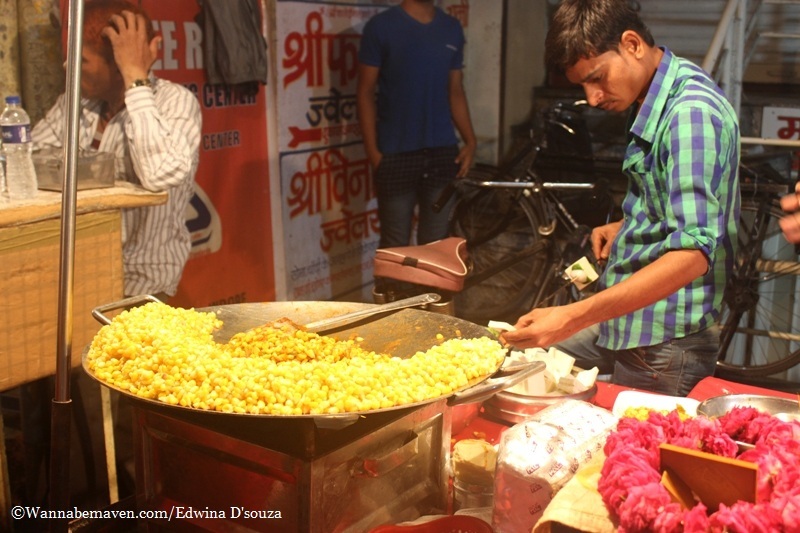 Indore is all about snacks, chaats and namkeens and they taste bloody damn good. 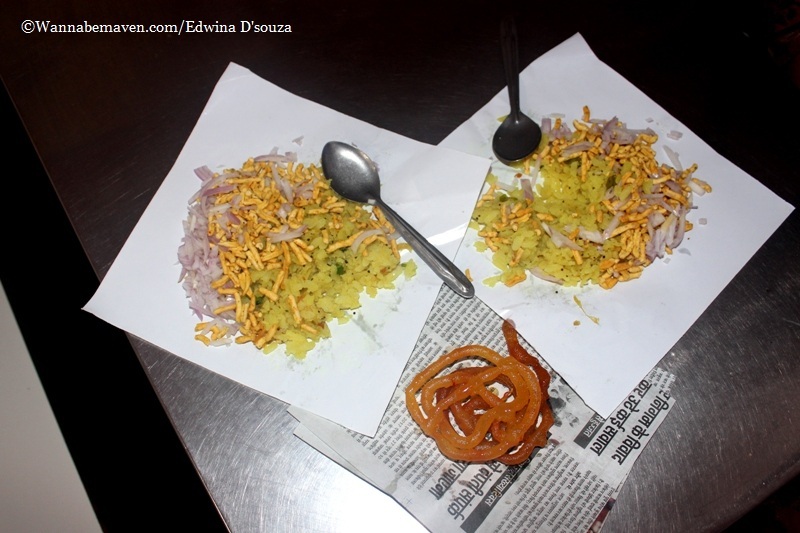 The ideal way to start your morning in Indore is to try the Poha Jalebi. It’s a staple breakfast for the people of Indore. By breakfast, I mean before 9.30am. That’s when it’s freshly prepared. The combination of poha jalebi may sound absurd initially, but you have to eat it to believe in the goodness of this delightfully simple dish. The poha is light with a hint of sweetness and some lemon for zest. It’s topped off with finely chopped onions and a generous helping of sev. Fun fact, people of Indore sprinkle sev on literally everything. The poha is accompanied by piping hot jalebi which is crunchy on the outside with a sweet syrupy filling. It went really well. We tried our Poha Jalebi at a nondescript stall on the highway from Indore to Mandu, although every other lane in Indore serves up this dish. 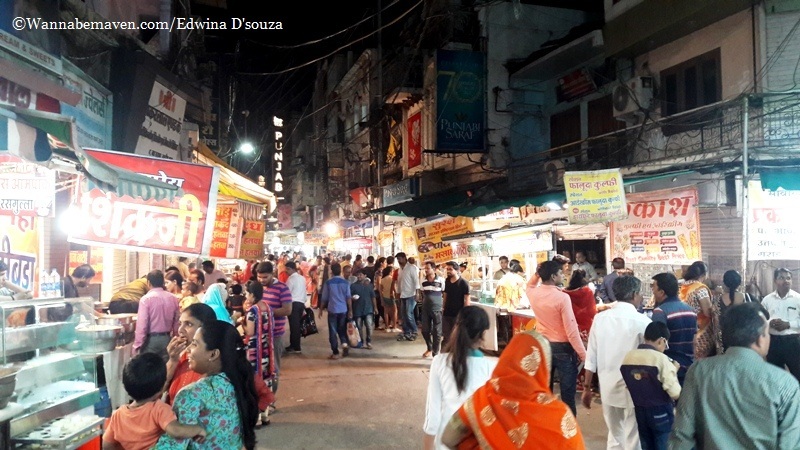 We’ve all heard about the legendary Sarafa Bazaar, Indore’s night street food market. Would you believe Sarafa Bazaar’s khau-gulli is actually a jeweller’s market by day. Come 8pm, food carts line up the lane and turn it into a foodie’s paradise. It’s like the Muhammad Ali road for vegetarians, open 365 days from 8pm till 2am. Once here, waste no time to try the Bhutte ka kees, a true original and a specialty of Indore. Boiled corn is mashed and cooked in milk, ghee and spices, then topped off with shredded coconut, coriander and chilly powder. It requires an acquired taste and, in all honesty, was a little too rich for my liking. Another local dish to tick off is the Garadu which is diced yam, deep fried and served with an extra spicy chaat powder. Tip: Never tell your chaat wala in Indore to make the food spicy; their level of spicy is on a different level. I just couldn’t eat more than one piece of garadu. It was way too spicy (almost second to the Bhut Jolokia). To cool off, we tried the Coconut Crush – a recipe of coconut water, malai, sugar, water, and ice. Add all these in a mixer, blend for about 30 seconds and voila! The coconut crush was inventive but tasted just like coconut water, only creamier. 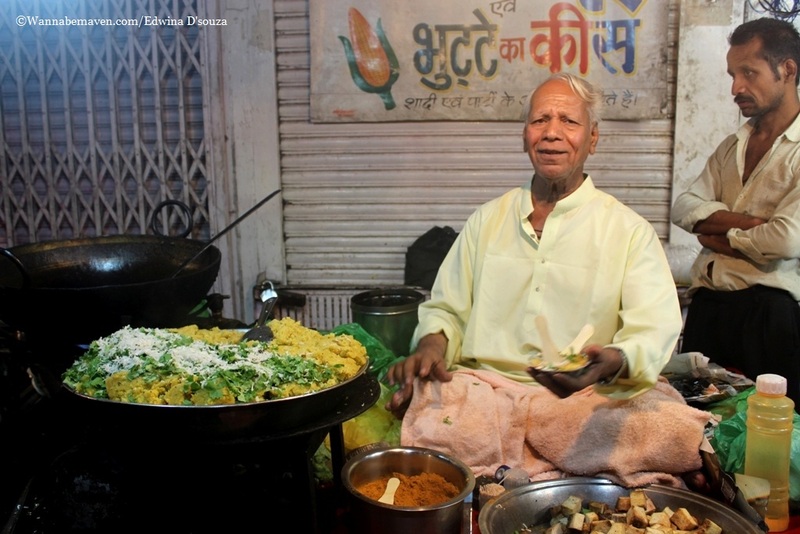 At Joshi’s dahi bada shop, foodies gather not just to eat the famous dahi vada but watch him make it too. He’ll toss the plate in the air like a pizza dough without its contents spilling. It’s quite a sight and gathers a lot of bystanders. By the time it was turn to try the dus pani wala pani puri, we were full, but gave it a shot nevertheless. The pani puris of Indore are special for the variety of spiced water. Apart from the regular pudina wala pani, expect kanji vada, adrak, nimbu, lassun, hing and jeera wala paani. They also serve 10 puris per plate. Bless their soul! We ended our food adventure with the Indori gundi paan. It’s quite a mouthful, ensuring the contents don’t drip as it makes its way from the thaal to your mouth. Our enthusiastic paanwala also insisted on feeding us the paan, an offer I politely refused. That night, we didn’t have the heart to try the Jaleba – a king size jalebi, Mawa baati, Coconut Pattice and the Sabudana Khichdi. Readers please make note to try them. Come back and tell me how it was. Sarafa may be the popular brother that rakes in tourists. But Chappan Dukaan (called so because of 56 shops) has its own local patrons. On our last day in Indore, we headed here to check out the food scene. The Shikanji at Madhuram is unlike the regular Shikanji made of water and lemon. Indore’s version has milk, nuts, dry fruits and rabdi. That it’s rich and filling is a given. Johny Hotdog is another legendary joint, open since decades and a favourite with the youth. It’s also possibly the only shop at Chappan Dukaan that sells non-vegetarian food. On offer are four items – veg hotdog, mutton hotdog, egg benjo and egg and mutton benjo. I tried all the four, but my favourite remains the Egg benjo which is an omelette tossed in a pan with ghee and served between a bread lightly grilled with butter, accompanied by ketchup, green chutney and some onions. The Chhole tikki at Young Tarang is another favourite among the locals although it didn’t taste anything different from the ones we eat in Mumbai. For dry-snacks and mixtures to take back home for your folks, Om Namkeen is your go-to place. Anything here is a great buy. Although if you ask me, the Khatta-Meetha namkeen and onion and garlic flavoured namkeens were excellent. We visited Indore in July. I’m thankful that it didn’t rain that night in Sarafa Bazaar. I don’t think I would have tried the amount of dishes I did, had it rained, since I am a little finicky about street food during monsoons. Chappan Dukaan on the other hand has permanent shops, so from the hygiene perspective a little better. Although Sarafa Bazaar is open between 8pm and 2am, the best time to get the pulse of the place is between 10pm and 11.30pm. Budget Food, Cafes and Restaurants, central india, Chappan Dukaan, Culture, Food, Food Trail, Indore, Madhya Pradesh, Offbeat Experiences, Sarafa Bazaar, streetfood, Streetfood in Indore, Things to do in Indore, things to do in Madhya Pradesh, Travel. Bookmark. very nice article.keep posting such nice articles.You can also visit http://www.indorepics.com for information about indore.